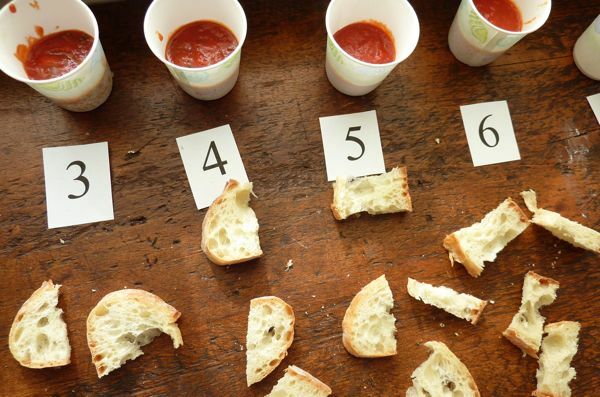 This is also how we found ourselves coordinating a blind taste test at the kitchen table on Saturday to determine which jarred sauce out there is the best. Or, to put it another way, which jarred pasta sauce is least likely to incur some kind of curse from the grave of my childrens’ two Italian Great Grandmothers. We spent a morning tracking down all the sauces that are readily available to us (including a pizza sauce from Trader Joe’s that Abby insists is the best) then, after dusting off my old Real Simple road test skills, I typed up a questionnaire for Abby, Phoebe, and their father. Each of the 10 sauces (including one quick-and-dirty homemade one I put together in 10 minutes, the time it takes to heat a prepared sauce) was spooned into its own Dixie Cup and served at room temperature. (No one knew which sauce was in which cup except for me.) 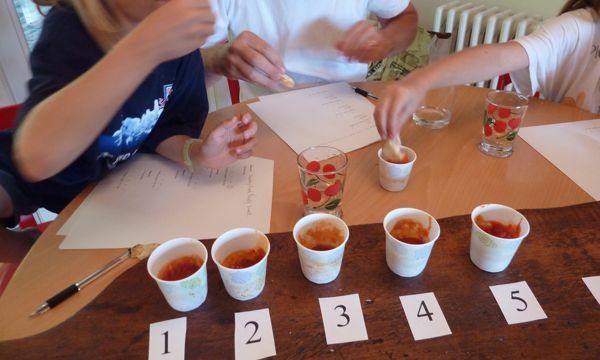 The three judges were given ten small pieces of bread each, one to dip in each cup, and tested the same sauces at the same time, in between tastes, cleansing their palates with a sip of seltzer made with our brand new seltzer maker. After each taste, the judges recorded some notes, gave the sauce a grade between 1 and 5, with 5 being the best, and 1 being the worst, then had to decide if the sauce should “go to Vegas” — which is So-You-Think-You-Can-Dance parlance for “go to the next round” and which, in the end, didn’t really mean anything but was still good for a laugh. We did conduct a Vegas round, but ultimately the winner was determined by adding up the point scores. Above, the judges in action. Amazing how much you can get done on a Saturday afternoon when there are no organized sports to race off to. The winner did not shock me — in my experience, Rao’s consistently trumps the competition in these kinds of contests. And amazingly, it can accomplish this without the massive amounts of sugars that helped the two runners-up (Don Pepino and Newman’s Own) snag their victories. But what really surprised me here were the supposed gourmet brands that ended up being absolute doozies. Take Whole Food’s Organic Classic Pasta Sauce, for example. Some of the words used by our judges to describe it? “Plasticky” and “artificial.” (Is this what you’d expect from their popular organic 365 line?) But at least that one was on the more affordable end of the spectrum — the one that really made me mad was Mario Batali’s Tomato Basil Pasta Sauce, which I picked up at a specialty kitchen store for TEN DOLLARS. (Business expense, I told myself.) What did our judges have to say about this one? “Horrible. 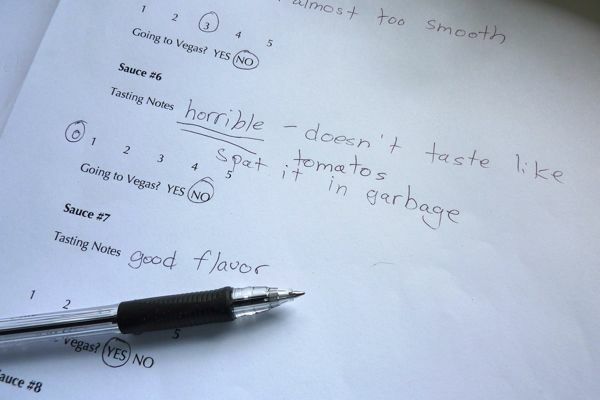 Spat in garbage” and “As if it was made in a test tube, designed by people who have never tasted actual tomatoes.” Even though the lowest point score one could dispense was 1, Abby decided nothing short of a negative 100 grade would express her disgust sufficiently. As for my homemade sauce, which came in sixth — behind Ragu for chrissakes! — I’m just going to tell myself it’s a relief: Unless I have time to make it the real way, it’s not going to be good, so what’s the point? Anyway, here are the full results of the test, in order from best to worst. All nutritional information is based on 1/2 cup serving. love this! we have the same issue in our house, except that our pasta lover wants hers with just freshly grated parmesan and butter, so it’s fairly simple. JMBH: I’ve made that one via Marcella, but not quick enough for after-school unfortunately. But yes: DELICIOUS and definitely quick enough for a weeknight dinner. We make a pasta sauce that’s very simple: olive oil, garlic, 1 can of Muir Glen crushed tomatoes, and basil, either fresh or dried. A quick spin of the emersion blender smooths it out for those who don’t like it chunky. We freeze it in little containers which thaw very quickly so that it’s always available for our Small Past Tyrant, a.k.a. 7 year-old daughter. With the addition of a little oregano, it also makes a good quick pizza sauce. The Muir Glen tomatoes make all the difference. They’re so much better than anything else we’ve tried. This is awesome! American’s Test Kitchen should absolutely start a series with kids (or you could beat them to it!) Is the RAO sauce easy to find at grocery stores or is it a specialty store brand? So glad I read this. Was going to make spaghetti & meatballs tonight, I always toil away making homemade sauce. Now I am off the hook and will be picking up Rao’s this afternoon. Whew! My favorite part about this post was trying to guess which comments were from the kiddos and which were from Andy. I bet that “Throw-uppy” is not in his vocabulary, but I could be wrong! Have to agree, Rao’s is very tasty. Their whole canned tomatoes are also amazing…I can’t figure out what it is, but it surprises me how good it is every single time. We only buy (well, hoard) it when it’s on sale, though. So fun! Thank you for sharing. Ever since a friend introduced me to Rao’s, I have never bought any other sauce. Amazingly delicious! Worth every penny and finding it on sale makes my day! I will have to try Rao’s. I also find the “Classico” brand sauces to be pretty good and not too sugary. I like Dave’s Gourmet Red Heirloom which I find at Home Goods/TJMaxx for a reasonable price of about $5.99 or so a jar (retail on Dave’s website is $8.99). It has 4 grams of sugar and only 280 grams of sodium per serving and no additives of any kind. I love the taste but it also lends itself to doctoring up with grated carrots, onions, capers, etc. Anything I’ve ever tasted from the line is terrific. A lover of anything tomato, I was also happy to find a new Heinz ketchup with 75% LESS sugar! It’s deliciously unsweet and not cloying like regular versions. I agree, I think Rao’s IS the best of the jarred! But a close runner up for me (not sure if they have it on the East Coast) is Muir Glen Organic tomato sauces. REALLY GOOD! Totally agree that Rao’s sauce wins hands down. I hoard it when it goes on sale. I will eat it from the jar when I’m prepping dinner because it is delicious. My current favorite quick homemade one is the recent Bon Appetit Pasta Al Pomodoro (from April 2011). I’m not familiar with Rao’s, and not even sure I can buy it here in Canada, but I’m certainly going to try and find it. I was also going to recommend Classico sauces. Inexpensive, minimal sugar, good-tasting. So disappointed in Mario Batali. Have fond memories of eating amazing food at Po before he became famous. I wouldn’t beat yourself up too much regarding your sauce. I have had issues with the flavor of Tuttorosso canned tomatoes particularly the ones with the green label. If you’re making sauce, try a different brand of canned tomatoes like Muir Glen or even Hunt’s. I think Rao’s is an east coast product. I had never heard of it before moving to NJ. People swear its the best sauce (and if anyone is wondering, you can order it online). I prefer Victoria’s brand to Rao’s though. Try Pomi which I think is the best virgin tomato product and sauce base on the market. Fresh Italian tomatoes in a puree or chopped version that haven’t been fiddled with. Just tomatoes. I always use the chopped variety because I like the texture; I’m going to try and somehow concoct a cocktail with the puree, vodka and spices. Another good thing is that Pomi comes in a tetrapak and not a can so not only is there no salt or sugar there is no BPH. If it makes you feel any better we have not used the jarred stuff since trying your homemade marinara. Goodbye Prego! Love this! Try Victoria Marinara next time. They sell in shoprite for about $5 a bottle… next to Rao’s its our favorite! Rao’s used to be our go-to until we discovered… Ooma Tesoro’s! It’s made by a husband and wife team in the Berkshires. Whole Foods has just started carrying it, so it’s worth picking up a jar for your taste-testers next time you go. You could put it head to head with Rao’s! Love this taste test. My kids are always bugging me to buy Rao’s because the one or two times they had it, they LOVED it. Now I know it’s not just because of the price! I agree Whole Foods pasta sauces are the worst–they taste like ketchup. The best marinara sauce, IMHO, is Trader Joe’s–not the ones listed here, but the one that comes in a can (I believe it’s low fat). It tastes freshly made and is not disgustingly thick like most jarred sauce. Rao’s, on the other hand? Overrated. Cool! Loved this post…had to finally comment and let you know it kind of made my day. I Laughed OUT LOUD at the photo of the poor ratings – love it. SO glad that my children’s chosen favorite (Newman’s Own) was on your list for an acceptable sauce…But if I ever see Rao’s I’ll give it a taste. “Throw-uppy” is now my favorite description. I’m the picky pasta eater in my home, so this was wonderful! I am glad I didn’t dish out the big bucks for Mario Batali’s sauce!!! We love Victoria’s Marinara. Its much cheaper than Rao’s and just as good! Love this! Jar sauce tends to be too sweet. Rao’s is good but hard to pay that kind of price. It’s definitely a special-occasion treat not an everyday quick dinner thing. My favorite go-to jar sauce is Mama Coco’s. It is in health food stores & specialty stores. I’m right there with you about Mama Coco’s. I am so, so interested to know more about the heavy snacks your kids eat (ate?) in the afternoon to tide them over until family dinner. I am trying desperately to institute family dinner at least a few nights a week, but my husband simply is not able to get home before 6:45, which is easily an hour later than the Under Six crowd likes to eat. What types of things (other than those you listed above) are on that list and how far in advance of dinner do they snack? I loved this post!! I agree Mario’s sauce is horrible- I look forward to trying yours! Thanks for this round-up. My family loves San Marzano brand, any flavor. Rao’s is top shelf at our grocery store, and I’m encouraged to try it. We bought a SodaStream Penguin a few years ago in an effort to break our habit of buying fizzy water by the case. Simple syrups infused with ginger, herbs (mint, especially), or fruit–possibilities are endless–make great sodas. Sounds like a fun family activity! Loved the comments, too. I like Classico (easily found here in the midwest), and have discovered that the roasted garlic version has easily 100-200 mg less sodium per serving than even other Classico flavors. I like to keep it on hand for quick pizza sauce, too. Amy’s Family Marinara is our favorite! My kids don’t like big tomato chunks and are not big fans of ” the green things” floating in the sauce. Amy’s has a great tangy tomato flavor without the overpowering sweetness of many of the major brands. When one of your respondents stated “very subtle heat”, did it make your culinary and mother’s heart swoon? Great post. I don’t consider myself a critic or a connoiseur but I tried a marinara that stood head and shoulders above others I’d tried in the past…Bove’s Basil out of Vermont. Delicious and extremely fresh tasting. I love the comments!! I have to incorporate that into our next taste test so much more fun than just discussing… Do you like your homemade selzter? We drink tons of sparkling water but I never thought to make it. How many bottles do you get before you have to replace the CO2? Don’t feel badly about the middle of the pack placing of your homemade pasta sauce- When I was a surly teenager, my dad was really into cooking and did a taste test with just two pasta sauces- his homemade one and Newman’s. I swear I chose Newman’s just to make him feel bad! Isn’t that an awful story? We were able to laugh about it years later but I can still remember how crestfallen he looked when I chose Paul Newman’s over his. I don’t think your little angels were pulling that one on you (note however: not so many taste tests with surly teenagers!) Great information, as always, thank you! I am such a fan of blind taste tests. It is always fun to uncover the gap between what we believe is the best and what we choose as the best. I have not tried RAO’s but I might give it a go now. I usually bite the bullet and make my own. Thanks for the fun. I heart Rao’s. It is hard to spend the $8 but I do each time because it is that much better. Usually I make a “vat of marinara” using the giant comercial size can of San Marzano tomatoes from my local Italian market (if you sute the onions in butter and olive oil the butter really rounds out the sauce) and freeze it in smaller containers. But I always keep a couple of cans of Trader Joe’s Tuscan Marinara on hand for back-up. I think it’s the best pre-made sauce out there. That’s hilarious! I definitely need to try the Rao’s, never heard of it! I have to say once I made a good homemade sauce once, I was ruined for the jarred stuff for life. What a fun activity I am defiantly going to try one afternoon! My kids are pretty picking when it comes to pasta sauce. I am to blame for this by serving my homemade sauce weekly. I would love to find a “go to” sauce they will tolerate and possible enjoy. Did you know that Jon Bon Jovi’s Dad has a line of pasta sauces? It’s called Bongiovi Brand and let me tell you it is amazing. I love the slogan, This ain’t your Mom’s sauce…It’s my Dad’s. They are hard to find in stores, I think they’re only on the east coast but worth it if you can find it. Otherwise their website is http://www.BongioviBrand.com you can always order it there. Bongiovi sauce? Butter, dried garlic? I dont call that pasta sauce. Loved reading this! Didn’t see my favorite, though — Monte Bene (from New Jersey, but available at Whole Foods) – just the best. We like the Victoria sauces ,usually purchased at Shoprite. A good compromise between Rao’s and price and often on sale. Then we made an interesting discovery. The Shoprite Special Editions series IS Victoria. Same bottle ,nutritional info.,ingredients but cheaper yet and also goes on sale. Not as many varieties,though. A clerk, for whatever that is worth, verified that it was indeed Victoria. As long time Victoria users, my wife and I could taste no difference. The bad news is the last time we checked they were gone so we will just go back to Victoria if they are no longer available. There are so many sauces out there that are regional or you did not test that it is really hard to make a dent. We like Victoria. Costco sells two 40oz jars of marinara for the price of one 25oz jar of Raos. Raos is really good but very expensive. Shoprite supermarkets have a regular and a premium line. The premium line is really good, comes in several styles, and is often on sale. We are selective and cost is not our first concern. The brands we choose do not use cheap ingredients like tomato paste or corn syrup. We look for ingredients like SanMarzano tomatoes olive oil, fresh basil, fresh garlic, etc. I do love Rao’s, but if you haven’t tried Hoboken Farms, available at Whole Foods & Bed, Bath & Beyond, you have to—it’s incredible and my kids’ absolute favorite!